Is Ethanol (E85) in Your Future? Ethanol or "grain alcohol" is a renewable fuel produced by the fermentation of plant sugars. In the US, it is usually made from corn and in countries like Brazil, it is made from sugar cane. I don't have any ethanol information in my book "Electricity - Make it, Don't Buy it" because I always thought that it took more energy to make ethanol than you get out of it. And that seems to still be the case... maybe. I say "maybe" because it all seems to depend on who you ask and how they do their calculations and also "where" it is made and what feedstock they are using. The study most quoted is the one by the US Department of Agriculture which concludes that modern ethanol production is 167% efficient. To read the report, click here: ethanol-report.pdf. That means that for every BTU of fossil fuel used to produce the ethanol, you get 1.67 "ethanol BTUs" out of the process. Actually, the figure is 1.06 "ethanol BTUs" out, but when they add in all the other profitable byproducts of the ethanol production process, the figure comes out to 1.67. Byproducts include carbon dioxide and animal feed. Other critics say that the Department of Agriculture study is flawed because they don't include things like the cost of the refinery construction. Don't ever try this at home - I'm sure you have seen plans for sale that say you can build an "alcohol still" in your back yard and run your car on the stuff. Don't do it - you'll spend more money fermenting the corn and distilling the alcohol than you will get in return. US ethanol producers currently get about $1.20 a gallon in "tax incentives". I think the Brazilians have a better method though... they use sugar cane as the feedstock and unlike the dummies in the US who use electricity and natural gas, they burn cellulosic parts of the sugar cane stalk to produce the heat used in the distillation process! Sugar cane alone will get you 2x as much ethanol per acre of land, so you can see how the Brazilians are playing a whole different ball game down there in South America. We can't even grow sugar cane in most of the US, so how are we going to compete with that? That must be why Brazil is called the "Saudi Arabia" of the ethanol industry. Finally, when evaluating claims about plant based fuels, be aware of who is providing the data. I've read many glowing reports about the wonders of ethanol only to reach the bottom of the article to flnd out the ethanol advocate owns a corn farm or is otherwise heavily invested in the industry. As Dr. Walter Youngquist has pointed out, "the company which makes 60 percent of US ethanol is also one of the largest contributors of campaign money to the Congress". By the way... the same goes for the oil industry making statements about ethanol. As you can see, it's hard to figure out who's telling the truth and who's not. I guess everything requires a bit of energy to get it to market, but some things just don't make a whole lot of sense to me. Take the oil sands in Alberta for example... it takes 2 gallons of fossil fuels to get 3 gallons of oil out of the sand. I'm no mathematical "whiz kid" or anything, but it seems to me that you are only getting one "net" gallon of fuel out of this process and you had two to start with! Wouldn't we be a whole lot better off if we just used that 2 gallons directly in our cars instead of wasting it on the destructive extraction process that only produces one net gallon?! They should leave that oil in the sand until they figure out a more efficient way of extracting it. I try to approach these things in a common sense way... I only tell you about energy ideas that I think are workable in real life. Ethanol would never have even caught my attention if it were not for the FFV's. What are FFV's you ask? 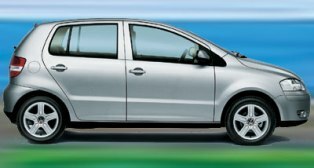 They are Flex Fuel Vehicles (like the Volkswagen Fox pictured here)... You may not even know it, but you may actually be driving one now. You can find E85 fueling stations at this site: www.getbiofuel.com. To figure out if you have a flex fuel vehicle, just check your gas cap, inside your fuel door, or your owners manual. FFV's will run on E85 - that's a blend of 15% gasoline and 85% ethanol. The FFV's in Brazil will run on pure ethanol (E100). All cars will run on E10 - most of you are already buying E10 and you don't even know it. Ethanol is what is being used to replace the more dangerous MTBE additive in gasoline. Don't even try to run your non-FFV on E85 - it will not work and it will damage parts of your engine. You can convert your car if you really know what you are doing, but that should be left to the experts and is beyond the scope of this newsletter. I like biodiesel, but the fact is only 1% of US automobiles are diesels as compared to 20%-40% in European countries. I can assure you... in the US, we like our "fast" cars - who ever heard of drag racing a diesel? (OK, don't email me if you race diesels - what I mean is a diesel will never outrun vehicles that run on other fuels - they'll outpull them, but won't outrun them). I think FFV's will sell well in the US. Actually... it seems that they are already selling them here and just not telling anybody. Xethanol update: company troubles and possible scam. Just as I was putting the finishing touches on this month's newsletter, my Mom just happened to hand me a story in the Savannah Morning News entitled "Moonshiners are Coming" . It said that the Xethanol Corp. was going to open a plant in Savannah by November 2006. It's not going to be your typical ethanol plant though - it will be a plant that converts waste biomass into ethanol. Biomass is anything containing sugar or starch like kudzu vine, paper pulp, waste from tree harvesting, wood chips, corn stalks, etc. They say they can produce ethanol in this manner for about 85 cents a gallon as opposed to $1.30 a gallon for corn based ethanol. Now we're getting somewhere! Just goes to show you how fast this technology is advancing. Folks, let me tell you... we have pine trees and kudzu coming out of our ears down here in Georgia. We've been trying to get rid of kudzu for many, many years now. That stuff will literally engulf your home if you're not careful. If we can find a "good" use for this horrible vine, then that will be a real miracle! And we have plenty of corn stalks and other biomass too! From what I can tell, new corn ethanol and biomass ethanol refineries are springing up everywhere. Maybe E85 ethanol really is in your future! Just letting you know what I have done with ethanol fuel. There is a station in my county that sells E-85, which is otherwise very hard to find in Texas. They started selling it Aug 06, and I started experimenting a month later. I have an old Farmall tractor and an old-time air-cooled VW beetle that have now run on E-85 for 2-1/2 years. You only need recalibrate the carb jets experimentally, add extra intake heat to fool the engine into thinking it's summer, and in a "modern" engine, advance the timing. The how-to details are in a slideshow on my website: http://www.txideafarm.com If you want to provide a link to my site in your mailings, go ahead. It'll take a mechanic knowledgable in carburetors about 4 hours to make the conversion and "tune" it up. The VW car gets 85% of its gasoline mileage, when the fuel is only 71% as energetic as gasoline, gallon for gallon. The difference is extra efficiency: it wrings more shaft power out of every BTU it does have, even though there are fewer in each gallon. The tailpipes and sparkplugs are a lot cleaner. And I have actually measured an increase in available torque. All these verify the efficiency improvement on ethanol vs gasoline. For a year and a half now, I have run blends in my lawn and garden equipment and my F-150 truck. The garden equipment works fine on E-34 blend, totally unmodified. That's 2 gallons of E-85 to to 3 gallons of unlead regular in a 5 gallon can, at the filling station. What could be simpler? The totally unmodified truck runs fine on blends as stiff as E-35 year round, and gets exactly the same mileage that it got on gasoline only, while the store sells E-85 at 30 cents a gallon cheaper than regular. I just put no more than 2 gallons of E-85 into the tank for every 3 gallons of regular (no more than 40% E-85). It splash blends right in the tank. For practicality in a real vehicle, you need to know about how many gallons it takes to fill, from each mark on your fuel gage. That's easy to figure out. Figure E-85 gallons as 25%, to no more than 35%, of that number, put it in, and top it off with regular. That'll keep you at E-35 or under, no matter how imprecise you are, and it is E-35 or under that works in unmodified vehicles. Everybody in America could do this, if the fuel were widely available. And, an E-35 blend is about 96 pump octane, way better than premium. None of my vehicles or machines has ever had a single materials problem. Not one. No enhanced corrosion, no dissolving parts, no leaking seals. And the tractor dates back to 1944!